Have we been overlooking the very first lesson in true Christian living? 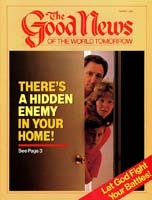 There's an enemy in your home, probably. You haven't seen this enemy. He's right in your family — he's made you all suffer — he's broken up many families, caused untold suffering and a world of unhappiness. But you never saw him. He's kept hidden from your sight. It's high time you opened your eyes and took a good look at him, so you can recognize him for the villain he is. The psychologists call him "emotional immaturity." But that's something many people know nothing about. It's something "educated" people talk and write about, but seldom understand. It is not something to be learned about by college graduates. It is something that ought to be taught in the first grade — and taught to 4-, 6- and 8-year-olds in the home. It is the technical art of putting into practice the Ten Commandments. It is the real secret to human happiness. But it is just not taught! How, after all, can parents teach their children, when they themselves are emotionally immature? How can teachers instill emotional maturity in children when they have not grown up emotionally themselves? Yet here is the real secret of ability to live the Ten Commandments. It's the real secret to Christian living and perfection. It's the real distinguishing mark of the truly educated person. That it is not realized and instilled in children while they are growing up — that it is not a required basic course of training in all colleges — is a terrible indictment against education, religion, society. One author defines emotional maturity as development from the state of taking to the state of giving. Taking is the way of Satan. Giving is the way of God, and the principle of His law. LOVE is giving. A little baby learns, generally, only how to take. He will take his bottle, his rattle, his toy. It becomes his human nature to take. Humans know absolutely NOTHING at birth. But a baby responds to Satan's negative influence, develops a selfish nature and begins to reach out to take whatever attracts or tempts him. Humans must be taught to give. Giving is something that has to be LEARNED. But how many begin teaching their babies this principle — the very principle of God's law and of true love? Let us define it further. All human beings are actuated by their emotions. But do we ever stop to ask and analyze what are these emotions? An emotion is a strong feeling — a disturbance — a departure from the normal calm state of rational thinking and acting — an impulse toward an action that has not been reasoned and approved by the mind. Among the emotions are such feelings or impulses as fear, anger, disgust, grief, joy, surprise, yearning. And first cousin to emotion are our moods. An emotionally immature person is usually one who is moody and has never learned to control his moods. More and more I am impressed that one of the most important truths we humans overlook is that human beings are not equipped with instinct, like dumb animals, to guide us into the proper course. Animals do not have the mind power, knowledge, ability to reason and mentally direct their actions. God endowed them, instead, with instinct that guides them along in the channel He intended. God endowed man, in His own image, with MIND. Man must first learn and acquire knowledge. He is endowed, also, with capacity to reason from that knowledge — to think, to plan, to arrive at conclusions, to make decisions. God intended man's mind to direct his actions. But man must learn to do this, and he can never achieve God's PURPOSE in placing him on this earth until he does. The development of right CHARACTER is the purpose of human life. And character is ability to come to right knowledge and wisdom and then to direct the mind and body into this right course. But we poor humans act as though we believed man to be merely the highest of the dumb brutes — as if man were equipped with instinct, and the purpose of life were merely to ENJOY such feelings, sensations, emotions and moods as impulse attracts us to, without thinking or mental direction! I once knew a tragic example, a man highly educated, whose life had been devoted to the field of education, assuming readily the responsibility of teaching others, when he himself had not learned this central truth of life. His mind was stored with knowledge of science, history, mathematics, literature. He had knowledge of facts about the earth, the sun, the moon, the stars. He had acquired knowledge about many other things, but not about himself — his moods, his feelings, his drives, impulses and desires. He had not stopped to study and analyze them, let alone learn to control them. As a child he had been pampered, petted, spoiled — permitted to have his way, never taught self-restraint, self-control or how to understand his moods, feelings and desires, and to control and guide them according to the sound reasoning of the mind, instead of impulsively following them without mental direction. He was married, had a fine family, an honored position with rare opportunities. But letting feelings, moods, impulses dominate his mind, instead of making his mind rationally and wisely direct them, his marriage crashed, his home was broken up and he fled in fear from his high position and brilliant future. He not only wrecked his own life, he forced great sorrow, unhappiness and suffering on many others. His emotions had so dominated his mind that he came to see circumstances through the eyes of his feelings, and his understanding became warped and distorted. Physically he grew to normal maturity, and was reasonably proficient in athletics. He possessed a number of university degrees. He was mentally mature so far as this world's faulty education instructs. But, emotionally, he was still somewhere between ages 8 and 12! And, sadly, his spiritual age was no older. The great tragedy of our generation is that nearly all people mature physically, perhaps half to two thirds mature mentally, but very few ever grow up emotionally or spiritually. One is not a fully mature man or woman, as God intended, until emotional and spiritual maturity has been reached! The time to start this emotional "growing up" is the same time mental training is begun. It should be started in the home, within the first months of a child's life. Parents, STUDY your own children. Remember that training of the emotions involves control and right direction of feelings, tempers, impulses. It means control over anger, jealousy, hatred, fear, grief, resentment, selfishness, vanity. And since the RIGHT direction is the way of God's law — and since that is the way of LOVE, and love is the principle of giving instead of taking — it means the teaching of your children to use their own minds to understand their moods and guiding them in the direction of GIVING — of love toward others, equal with love toward self. Yelling, loud talking, bursts of temper, rudeness — all these are lack of emotional "growing up." Emotional immaturity is simply letting human nature run sway without any control from a right-thinking, reasoning mind. Teach your children to let their MINDS direct their natures properly and wisely. I remember the first funeral I was called on to officiate. At funerals many people let their emotions of grief run uncontrolled. A great fear seized me. I was afraid I would not be able to keep calm and control my own feelings, and I knew I must do that and, with calm tenderness and sympathy, comfort the bereaved. I was much younger then, and in the emotional struggle that went on inside my mind over ability to carry this responsibility, I began to go to pieces. I announced to my family I just couldn't do it. We were at the time visiting in my father's home, and he came over to me, put his hands on my shoulders, and calmly shook me, saying in a voice of authority with which he had not spoken to me since I was a child: "Here! Snap out of it! This is your responsibility! This family is broken up in sorrow, and they are relying on you. You can't back out of it! Wake up! Come to yourself! Get a grip on yourself! You are going through with this, and you're going to do it with credit and calm dignity and sincerity!" That, I remember, sobered and calmed me and brought me back to my right senses, and I replied quietly, "Yes, Dad, of course I will." Then I went to a private room, closed the door and talked to my heavenly Father about it, and received from Him the emotional control I had lacked for this ordeal — and that first funeral was an ordeal. But when I literally placed myself in God's hands as His instrument, He used me, and the words He spoke through my mouth resulted in the conversion of the bereaved parents. I found it difficult, as I was later more and more frequently called upon to officiate at funerals, to so control my own emotions as to achieve right balance — that outer calmness, without going to the opposite extreme of hardening my senses so that I would not feel proper sympathy. It was through God's help and much prayer that I was able to achieve emotional control, with dignity and poise, yet with extreme tenderness, gentleness and heartfelt sympathy for those in sorrow, so that I could give them the help they needed in their greatest trial, and still not break down with them. Surely no one can achieve real Christian growth and perfection until he has acquired emotional stability. Our tempers, feelings, emotions were given to us for a purpose! They are not to be nullified — merely intelligently guided by mind control into the proper channels of God's law! Of all the phases of life, there is none in which emotional immaturity is more apparent than in religion. Here, too, people are prone to go to extremes. Either they deliberately work up the emotions to a frenzy or they make their religion a wholly mental expression, restraining the emotions and feelings entirely. Many, usually the more illiterate or at least less educated, follow a religion that is almost wholly emotional. In "meeting," the preachers say nothing that is thought provoking, but only that which is emotion arousing. They do not teach or instruct, they generate unrestrained emotion. They ask the congregation such questions as "Are you happy?" — echoed by thunderous "Amens" or shouts of "HALLELUJAH!" The main job of the preacher is to generate wild shouting, uncontrolled emotion, until the whole congregation is out of control in a frenzy of fanatical exuberance. Then there are the more quiet emotional sects — but who also accept the counterfeit of sentimentality and emotion for deep spirituality. Indeed it seems most fundamentalist groups accept one form or another of EMOTION in place of true spirituality. But emotion is not spirituality. Emotion is physical reaction. While a certain emotional reaction should naturally follow true and deep spiritual experience, nevertheless it is a physical reaction from that experience and is not, in itself, spiritual experience. Emotion is produced by the nervous system of the fleshly body. It is, therefore, of the FLESH, not of the SPIRIT! The Holy Spirit of God is given only to those who OBEY God (Acts 5:32). Most religious bodies who mistake the emotional counterfeit for genuine spirituality preach that "God's law is done away" — preach a doctrine of "salvation without works," by which they mean without obedience to God or to God's law. No one is a real Christian unless he has received and is being led(in obedience to God's law) by the Holy Spirit (Romans 8:9, 14), and the Holy Spirit in us is the LOVE OF GOD (Romans 5:5), which is the only love that fulfills God's law. And also the Holy Spirit is the Spirit of a SOUND MIND (II Timothy 1:7). True spirituality, therefore, is SOUND MINDEDNESS, for true spirituality can come only from the SPIRIT OF GOD within us. True spirituality is RATIONAL. On the other hand, true spirituality is not a mere mental religion divorced from all feeling and emotion. There are the purely mental religions that do not even believe in the Holy Spirit of God. And there are some of US, perhaps, who have come to know God's truth — who have surrendered to God, truly repented of our own way, turned from the ways of the world and who are devoted to studying the Bible to learn God's way so that we may live by every word of God — and who also pray a great deal, but who yet LACK the very second FRUIT of God's Spirit — JOY! Emotional maturity does not mean emotionless maturity any more than it means uncontrolled emotion. The truly emotionally mature are Spirit-guided by sound Spirit-mindedness — by God's Word — and the emotions are CONTROLLED, but not anesthetized. The emotionally grown-up DO express enthusiasm, JOY, happiness. They DO feel and express gratitude, reverence, adoration in their worship of God. They do feel and express compassion, mercy, sympathy. God is a spirit, and they that worship Him must worship IN SPIRIT and IN TRUTH. One cannot worship IN SPIRIT unless he has received and is led by God's Spirit. One cannot worship IN TRUTH without UNDERSTANDING of God's Word with a sound mind. But this kind of worship is not devoid of feeling and resultant emotional expression. Even though the emotion is physical reaction, it does truly accompany or react from true spiritual experience. But it is not a substitute for it. The emotionally mature will properly express sympathy in a most sincere manner, from the heart. They will express, on occasion, when called for, sorrow, anguish, compassion. And they will also express good cheer, happiness, enthusiasm, zeal and that happiness that is brimful and running over, called JOY! It sort of sums up, then, that the emotionally mature combine the controlled expression of emotion with physical health and an educated mind that is Spirit-begotten and Spirit-led, doesn't it? In other words, emotional maturity develops hand in hand with physical, mental and spiritual growth, the four blending into, finally, the perfect spiritual CHARACTER we were put here to become. YOU probably have a long way yet to go. You have a grave responsibility, if you have children, in their EMOTIONAL training as well as their physical health, mental education and spiritual guidance. We shall all be called to account someday. How will YOU answer?